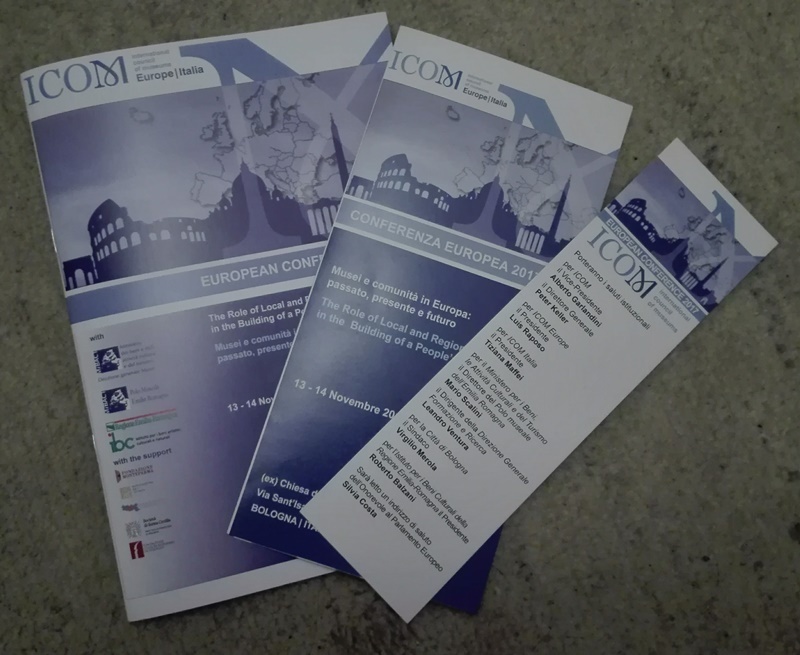 This is the second of two posts about the ICOM Italy conference held in Bologna last week. You can find the first part here (which mostly focuses on the Italian experience). This second post has a broader range, with talks from Iain Watson of the Tyne and Wear Museums in the United Kingdom, Maria-Xeni Garezou from ICOM Greece, Dorit Wolenitz from Israel, and Nina Zdravic from Slovenia. One thing which was immediately different about the afternoon session – other than looking at Europe more broadly – was a more forgiving attitude to museums as places of entertainment and experience, as well as education. This was expressed best by Iain Watson, Director of the Tyne and Wear Museums and Archive. Iain outlined the role of the Museums Association in England. The motto of the MA is “Museums Change Lives” – essentially, museums are good for people, places and understanding. The association covers a broad range of institutions – public, private, military, educational, and corporate. One thing the sector as a whole is facing is budget cuts; for this reason, the sector has had to get creative in how it sources funds. It’s getting better, Iain said, but they still have a way to go. Around 64 museums have closed across the UK since 2010. Despite the cuts in budget, however, the sector remains strong. Here’s one interesting indicator: More people visit museums than Premier League football games! Next up was Maria-Xeni Garezou who discussed the Greek situation. Unsurprisingly, Greece has a large number of museums – around 700. Sites from antiquity are state property and are therefore managed nationally. But there are also regional, local and smaller archaeological museums. One problem facing the Greek museum landscape is indifference from the local population; according to Maria, although Greek people are very proud of their ancient history, they do not engage with it. However, a nostalgia for the rural past has led to a proliferation of agricultural museums, and also cultural institutions which focus on national unification. Something similar is happening in Israel, where the state manages the most ‘important’ antiquities and sites. Dorit Wolenitz, Director and Chief Curator of the Man and Living World Museum, highlighted the role of other smaller museums. These tend to focus on specific cultural groups – for example, the Museum of Hungarian Speaking Jewry. In this way, museums become mediators of the cultural, social and religious; they are multicultural venues. And so, these spaces must be relevant to their communities, becoming cultural centres which provide events, etc. Finally, Nina Zdravic from Slovenia told us about an interesting initiative to bring together many small (you could even say tiny!) collections along the Slovenian-Italian border. Zborzbirk means literally a collection of collections. The project is trans-national, trans-institutional and inter-disciplinary. As part of the project, 34 local collections were inventoried – these were often private collections in very remote areas. Some bigger collections were ‘museum-ised’, and several guides were produced, allowing visitors to better explore these assets. I nabbed a few of these and they’re lovely! I look forward to (some day) exploring these collections. Unfortunately, I couldn’t stay for Day 2 of the event, but I greatly enjoyed my short time in Bologna. If you find yourself exploring this wonderful city, allow me to recommend the Via del Pratello for a good range of interesting restaurants and bars. Many thanks to ICOM Italia for hosting and providing a lot of food for thought.